Potato (Solanum tuberosum) belongs to the Solanaceae family, which also includes tomatoes, eggplants, and chili peppers. Potato is currently the second widest used staple crop in the world. It was first domesticated in South America, in the Andean highlands, between Peru and Bolivia, more than 10,000 years ago. Different species of potato (solanum) exist, but the most common worldwide is the S. tuberosum ssp. Tuberosum. This species was introduced in Europe in the mid-1800s from Chile when a fungus disease almost completely destroyed S. tuberosum ssp. andigena, the original species imported by the Spanish directly from the Andes in the 1500s. The edible part of the potato is its root, called tuber. 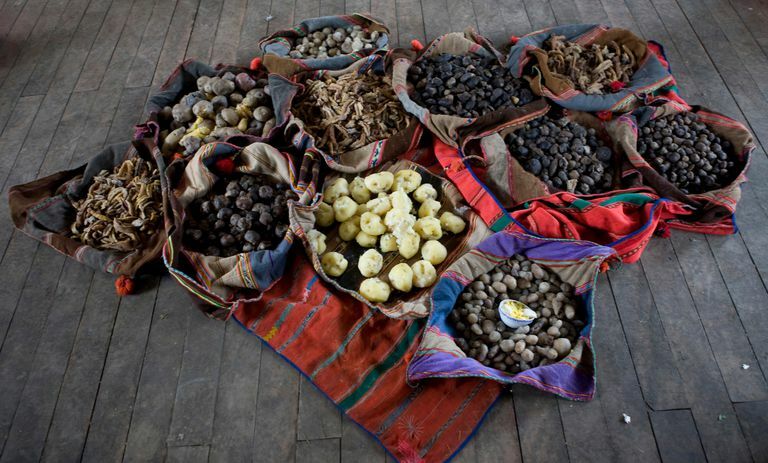 Because the tuber of wild potatoes contains poisonous alkaloids, one of the first steps made by ancient Andean farmers toward domestication was to select and replant a variety with low alkaloid contents. Also, since wild tubers are quite small, farmers also selected the bigger examples. Archaeological evidence suggests that people were consuming potatoes in the Andes as early as 13,000 years ago. In the Tres Ventanas Cave in the Peruvian highlands, several root remains, including S. tuberosum, have been recorded and direct-dated to 5800 cal B.C. (C14 calibrated date) Also, remains of 20 potato tubers, both white and sweet potato, dating between 2000 and 1200 B.C. have been found in the trash middens of four archaeological sites in the Casma Valley, on the coast of Peru. Finally, in an Inca period site near Lima, called Pachacamac, pieces of charcoal have been found within the remains of potato tubers suggesting that one of the possible preparation of this tuber involved baking. Although this may be due to a lack of data, current evidence indicates that the spread of potatoes from Andean highlands to the coast and the rest of the Americas was a slow process. Potatoes reached Mexico by 3000-2000 B.C., probably passing through Lower Central America or the Caribbean Islands. In Europe and North America, the South American root arrived only in the 16th and 17th century, respectively, after its importation by the first Spanish explorers. Ugent Donald, Sheila Pozoroski and Thomas Pozoroski, 1982, Archaeological Potato Tuber Remains from the Casma Valley of Peru, Economic Botany, Vol. 36, No. 2, pp. 182-192. Why Is the American Sweet Potato History Connected to Polynesia? What Ancient Culture First Domesticated the Botanical Source of Cocaine? How Long Have Ancient Americans Been Using Tobacco?